Many boats are compromises between conflicting desires to race and to cruise, but not this one. The Island Packet 370 has a single mission: cruising. It&apos;s now the smallest member of the Island Packet family, attracting both experienced owners moving up from smaller boats and newcomers with the means to make this their first boat. A few years ago designer Bob Johnson replaced Island Packet’s traditional transoms with scoop sterns that provide a large platform near water level; it was a wise move. Boarding from a dock is simpler, a built-in shower makes returning from a swim nicer, the stern ladder is out of the way, and moving people and goods to and from the dinghy is far easier on the newer design. The deck layout is pure, refined Island Packet. There&apos;s the familiar outstanding anti-skid pattern, excellent grab points where they&apos;re needed, an easy-to-reach boom, a high toerail, and a businesslike foredeck with substantial hardware, dual anchor rollers, and a divided anchor-rode locker. Our test boat had the optional Hoyt Jib Boom and staysail ($6,995) and a Muir anchor windlass ($7,695), both excellent systems. It&apos;s hard to improve on this deck layout for cruising. An in-mast roller-furling mainsail is now standard, and if you want a conventional slab-reefing mainsail, it will cost extra. There&apos;s a significant loss of sail area with in-mast furling, as the leech must be straight, and it can be hard to achieve a good airfoil shape, but it certainly is handy to set and stow. Somebody influential at the company must be tall. The cockpit seats are very comfortable, with nicely angled backs, but anybody under about 6 feet will wish for a foot brace in the middle of the cockpit sole. I was delighted by the cockpit stowage, which includes small bins (with drains) for items like cameras and binoculars. There are other bins that will accommodate, say, a gas can for the dinghy&apos;s outboard. The big seat lockers have interior catch releases so a trapped crewmember can get out; this detail is typical of Island Packet. There are line-tail bins to reduce the spaghetti that comes from leading lines aft from the mast. Island Packet gets this right, leaving the jib and staysail halyards at the mast. There&apos;s no reason to run these lines to the cockpit, as you&apos;ll hoist these sails on their furlers at the start of the season and leave them there for the duration. There&apos;s less teak on the 370 than on earlier models, which most owners will appreciate a couple of years down the line. Grabrails inside and out are low-maintenance stainless steel, and the cockpit coamings are all fiberglass. The high freeboard and wide beam that make an Island Packet appear rather stout at dockside pay off as soon as you descend the companionway ladder. The test boat had the optional "Plus Package" for accommodations (includes varnished interior woodwork, Corian counter surfaces, teak-and-oak cabin sole, and trim details for $14,950), and I suspect most buyers will choose this. The 370&apos;s huge saloon is filled with handy stowage spots for charts, books, and other cruising necessities. The galley is efficient, with lots of stowage. Island Packet is one of the few builders to provide keel-cooled refrigeration, a simple, efficient, trouble-free system that deserves a wider market. The double sink is slightly off the centerline, but not enough to backfill at any reasonable angles of heel. There&apos;s a large island double berth in the forward cabin, with good access from the sides—no pizza-oven entry or cramped foot space here. The head, with a shower stall and plenty of maneuvering space, has doors to both the saloon and the forward cabin. As elsewhere, locker space abounds. The halogen lights throughout the boat are on dimmers, a fine idea for a cruising boat that will spend time sailing at night. The offset double in the aft cabin appears to be a suitable seaberth when fitted with a divider. The nav station is integrated into the aft cabin; there is a pass-through to the saloon. It has no breaker panel; the circuit breakers and meters are a bit farther forward, behind a cabinet door. I&apos;m not convinced that the electrically powered adjustable nav seat is essential, but it should hold you in place effectively in rough water. You won&apos;t find any nits to pick with the fiberglass layup, wiring (there are messenger lines for future circuits), or plumbing. Everything meets ABYC and CE standards and is done right. The only way you&apos;ll destroy this boat is with explosives, massive boulders, or heavy machinery. I&apos;m less impressed with the engine space. Everything&apos;s installed properly, but reaching the parts may be a challenge. The engine lives deep in the keel sump, which is good for stability but bad for access. You can get to the top, front, and part of the sides for routine maintenance, but it&apos;s tight. The all-important filters could have easier access. The drive shaft and stern gland are buried deep under the aft bunk and could be hard to reach. Unfortunately, we had typical Chesapeake 3-H (hazy, hot, and humid) August conditions and an 8-knot southerly for our test sail. There&apos;s ample power available from the Yanmar diesel to push this boat along, however, and 3,000 rpm yielded 7 knots of boatspeed with about average noise levels down below. The turning circle is small, and the boat stopped and reversed reliably. There&apos;s no prop kick to either side, but the high bow may catch even light cross winds. The optional bow thruster ($5,195) will help make dockside maneuvers more graceful. There was little point in setting the staysail in these conditions, so we unrolled the main and jib and logged about 3 knots of boatspeed. Island Packets have long had rack-and-pinion steering for reliability, but the latest Lewmar Cobra steering system on our test boat was a big improvement over earlier versions, with nice feedback and easy control. Sight lines from the helm are excellent. The boat tacked easily through about 90 degrees, reached at about the same speed as it sailed close-hauled, and otherwise felt good. As with other Island Packets, the 370 will surely be right at home offshore in a good breeze and will be well suited to reaching through the trades. When the wind kicks up on a coastal passage, a boat this solid will feel mighty good. The roller-furling mainsail is certainly a detriment in light air. There&apos;s no substitute for sail area, especially on a moderately heavy boat like this. Still, it was nice to simply pull a string in the cockpit and have the mainsail appear or disappear. A big asymmetric spinnaker in a sock would be perfect for days like this. Here&apos;s where a buyer makes the big decision: Do I need to go as fast as a racer/cruiser, or am I happy to poke along in comfort and safety? 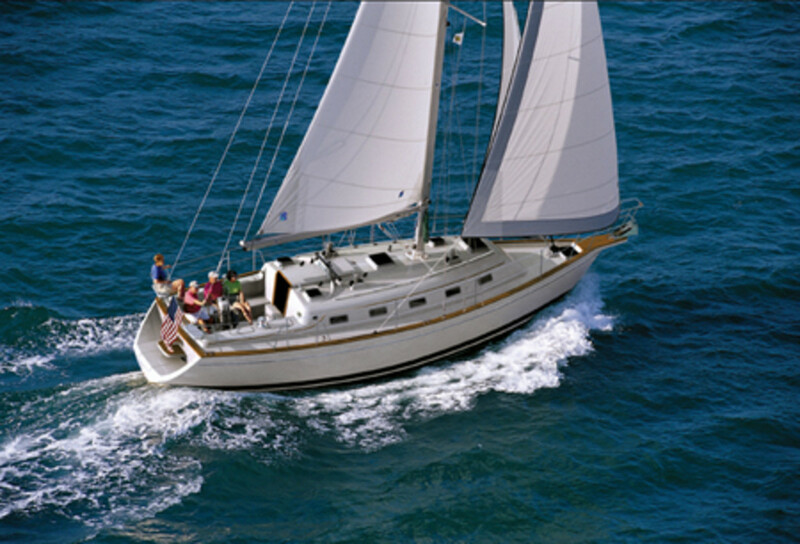 If you prefer to sail aboard a beautiful offshore-capable vessel, this is your style of boat. Nobody does the design and construction details like Island Packet. The meticulously built 370 is a strong, spacious cruiser, and its voyaging exploits will be limited only by the will of its skipper. Price: $259,950 (base) includes freight to dealer (continental USA), in-mast roller-furling main, 110% roller-furling genoa, AC/DC electrical system, propane stove, internal messenger lines for additional wiring. Construction: Hull and deck are hand-laid triaxial knitted fiberglass; deck is cored with PolyCore, and hull is stiffened by an interior grid system. Hull-to-deck joint is bolted and bonded with urethane sealant. Deck hardware is through-bolted with aluminum backing plates. All exterior teak is treated with Cetol.